Mathew Hayman wins the sprint in the Roubaix velodrome, relegating Tom Boonen and Ian Stannard to the lower steps of the podium and Sep Vanmarcke and Edvald Boasson Hagen trailing further behind. In a wild race, shown on TV from start to finish, this was the greatest surprise of the day, to imagine any scenario in which Hayman beat all of these riders in sprint would sound fanciful but this was the moment the race was won. Was it the fault of the television? The early break needed hours to form with a complicated matrix at work. The move needed to have representation from wildcard teams for whom to be seen on air is to exist but also the right mix of the bigger squads. Right from the start Team Sky, Katusha, Tinkoff and Trek-Segafredo were covering the various moves and no breakaway met the criteria, the likes of Nils Politt, Elia Viviani and Stijn Devolder notable for being so visible so early. If only this game was limited to filtering the move it would have been easier to watch but at the same time the open roads and the wind saw the race split into several groups. Finally after almost 100km of trying a move of 16 riders go away thanks to the efforts Yaroslav Popovych, riding his last race. Paris-Roubaix made the Ukrainian after he won the U23 race and the Baby Giro in the same year. As well as the right mix of teams there were some good individuals in the move. Sylvain Chavanel, Mathew Hayman, Imanol Erviti and Salvatore Puccio among them with Chavanel and Hayman visbibly cruising on the back of the grouo. Let’s call this a lunch time reservation. Why? Imagine the diner who knows they can’t get a table in top restaurant on a Friday night, the places are booked out by the wealthy and the famous. So they book for lunch, sit down and settle in for a long session and end up at the top table night falls despite the frowning staff. The same for our fugitives, they know they can’t match the likes of Boonen, Cancellara, Sagan and Kristoff after 250km so it’s better to go clear earlier, book a spot ahead of the race and wait and see if they can digest what will follow. Etixx-Quickstep missed the move, the story of their spring so far, and set Tony Martin to chase. There was still 175km to go so this looked hasty but it was their punishment for missing the move. Team Sky later joined in the chase too. The presence of these two teams seemed to reassure everyone that the breakaway, already jettisoning riders thanks to punctures and jammed chains, was going to be contained even if it had two minutes. Then came a big crash in the peloton. This caught out a lot of riders, notably Fabian Cancellara, Peter Sagan and Alexander Kristoff. This wasn’t Cancellara saying goodbye, more the race saying goodbye to him. He and Sagan were caught on the wrong side of split in the peloton. There was little they could do to fix things. Sagan’s team was lightweight to start with and Oscar Gatto was lost to a crash while Trek-Segafredo had lost riders to crashes too and one of their upright riders was busy in the lead group. Meanwhile Sagan and Cancellara had a queue of riders on their wheel, notably Niki Terpstra. Ahead those who’d survived the crash included much of Team Sky and Etixx-Quickstep because they were on the front chasing and suddenly the race took on a different allure. Lotto-Jumbo had numbers too with Sep Vanmarcke well supported and they began to distance the Cancellara-Sagan group. Popovych was pulled from the front group and sat up to wait for Cancellara but seemed only able to give the briefest of tows. With 63km to go, just before the Orchies pavé, the “Boonen group” of Etixx, Sky and Lotto-Jumbo caught the remnants of the early breakaway. 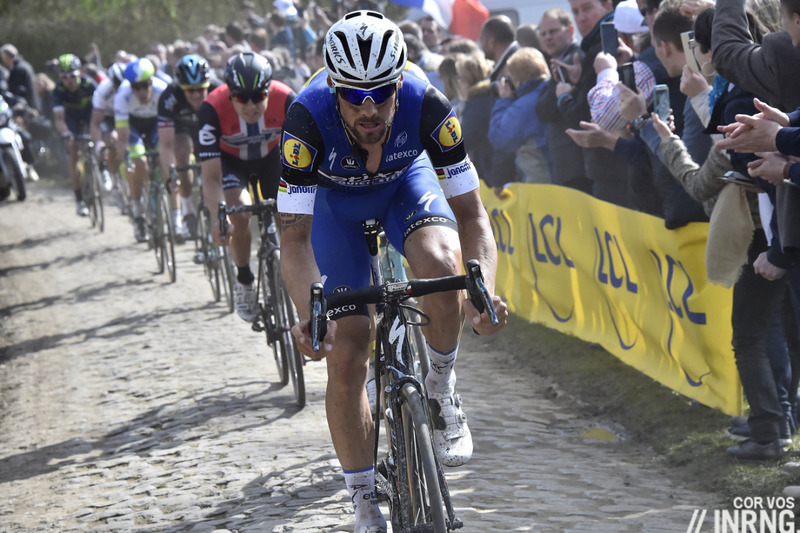 Boonen set to work with an attack on the cobbles to shake things up and suddenly he was back in the race like the old days, gone were the images of him struggling this spring. Then Sky took over, keen to use manpower to ensure Cancellara could not return as the Swiss made his move to try and get back. On the next cobbled sector Sky lost several riders in a crash as Gianni Moscon and Luke Rowe fell, Rowe would get up and get back but this must have cost him. If this was another form of entertainment there would have been an interlude. Attend Wagner at the opera there’s a break for the audience, no such chance for Paris-Roubaix. Even the riders have food and drink handed up to them but for the viewer a dash away from the TV meant potentially missing some plot twist. The reasons behind the six hour broadcast are interesting, probably the subject for a post in the coming days. By now the lead group was thinning with every cobbled sector and with 40km to go down to seven riders but dropped riders were sometimes making their way back, for example Marcel Sieberg made his way back. With 20km to go Ian Stannard accelerated on the Camphin cobbles, his move eliminating team mate Luke Rowe and shrinking the group down to him, Boonen, Boasson Hagen, Sep Vanmarcke and early breakaway survivor Hayman. Surely it was Hayman’s turn next to get dropped? It was. 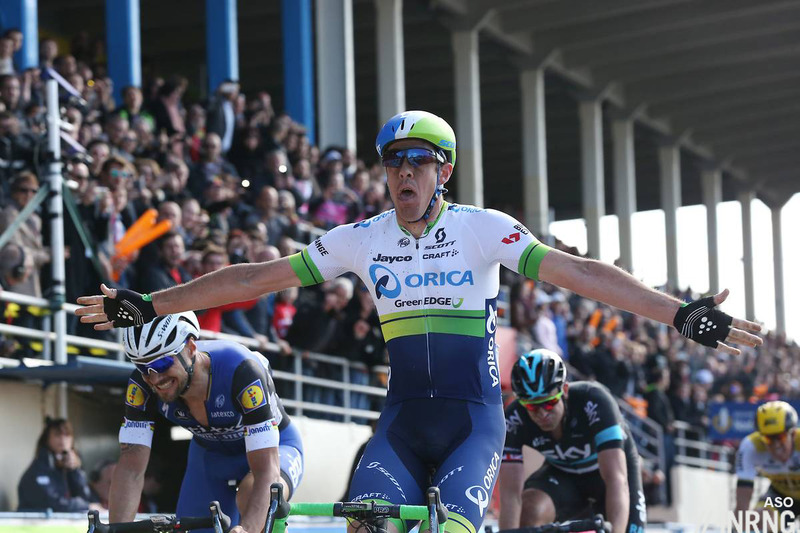 Sep Vanmarcke tore up the Carrefour de l’Arbre sector and Hayman was distanced. Yet by now the race took on a curious slow motion aspect. As much as Vanmarcke was flailing at the pedals he wasn’t pulling away. Nobody had any zip left in their legs and soon enough Vanmarke was reeled by Boonen and Hayman, the revenant, made it back. Into the last 10km and everyone tried a move or two. Vanmarcke kept insisting as if it was solo or bust in Roubaix. Stannard had a big go too and so did Boonen but again nobody could do much, the jump had gone from their legs, even Boasson Hagen the strongest sprinter, tried his move. So who was going to win in the Roubaix velodrome? Hayman’s spent 18 years as a pro and finished Paris-Roubaix 15 times with two top-10 performances before this so for him to feature in the finale again is no sudden surprise. Yet he entered the velodrome as most people’s last choice. Boonen and Boasson Hagen are famous for their finishing speed, Stannard has won the Omloop by outsprinting Greg Van Avermaet and Sep Vanmarcke’s got plenty of power on tap. But Hayman? A podium seemed possible if he tracked the right wheels. With half a lap to go Hayman led out the sprint and it looked as if he’d be overtaken by the others. Only he kept going and nobody was coming past. He looked as stunned as everyone else. Live on TV from start to finish, the experiment paid off with a hectic race that seemed not to have a calm moment. Perhaps the TV had a causal effect, the limelight encouraged some to keep going in search of airtime when they’d have otherwise given up? Either way it was a vintage edition with action and surprise for hours on end. Later on the race adopted a more classic format with action at the front and back shaping the race, the big crash that split the field the most dramatic example. The early break was big enough and had enough riders to keep going but only Hayman was able to hitch a ride to the finish even if others like Erviti also made the top-10. What was all the more remarkable is that he’d broken his arm in the Omloop Het Nieuwsblad and his spring classics campaign was supposed to be over. A good recovery, work on the home trainer and two days of racing last weekend and he was back in what the French would call his “course fétiche“, his preferred race. In a race that borrows riffs on Emile Zola’s Germinal and Eugène Christophe’s Hell of the North, a race that’s had its own “workers edition” this was a poetic finish with the worker, the domestique finally having his day. It might be a harder sell for the mass media, Hayman does not have the stellar pull of Sagan or Boonen but his win was no less deserved and should be no less celebrated. As usual, a stellar write up, and in very little time. Despite the short interval you have been reflective when most media is reactive, and that is a wonderful addition. This is the URL where I go now for great analysis. But I was thinking about whether a full day of TV changed the race. I can see the argument, and we’ll never know what was going on in the minds of the riders (besides a lot of expletives). Still, I am thinking that every DS in Northern France had the same instructions: Get on the front and either dictate the pace or find a way into the break. Was that imperative stronger because of the coverage? Or because the race is such a lottery of mechanical disaster? I think the latter, but it is one retired rider’s opinion. What matters to me is that we have the option for a rational and reflective conversation. And you are superb at hosting that. Thank you! Thanks for the kind words. The write-up doesn’t take too long, it’s waiting for the photos to illustrate the piece that takes the longest. Certainly for the breakaway the wildcard teams had to be there, we saw Bora-Argon 18 chase when they missed the move, such considerable efforts so early although this can happen without TV. Plus there still is the issue of bonus payments some riders/teams get for tv minutes. Apparently there are two categories: national and inernational tv. Someone from Giant-Alpecin just mentioned a few weeks ago, that it is apparently still happening in some teams, even in these times of the internet. But with or without these payments: A race changes of course the moment it is on tv – how this will develop, when races will be shown in full more frequently is an interesting question. Great write up and a great race. Interesting to note that Orica GreenEdge have now won three monuments to Team Sky’s zero, and each with an ex-Sky rider. Also with yet another second place this makes Marcel Kittel the most successful Etixx rider of the cobbled classics season…. Hayman wasn’t so much dropped as shouldered out of the way, but all is forgiven now. Seeing the whole thing was a nice novelty, but not sure it’d be that interesting every time. Despite the commentators (on Aust. TV at least) mentioning that Hayman and Stannard must have been close after their years together at Sky, there was no love lost between them on the podium. Boonen on the other hand was chatty and congratulatory with Hayman, which deserves special mention considering Cancellara’s sour face on the podium beside Sagan last week. Perhaps due to the almighty chop Stannard gave Hayman on the LH corner at the start of the Carrefour de l’Arbre sector that led to Hayman being initially distanced there. Yeah, that was my point, might have been a good moment for Stannard to apologise! 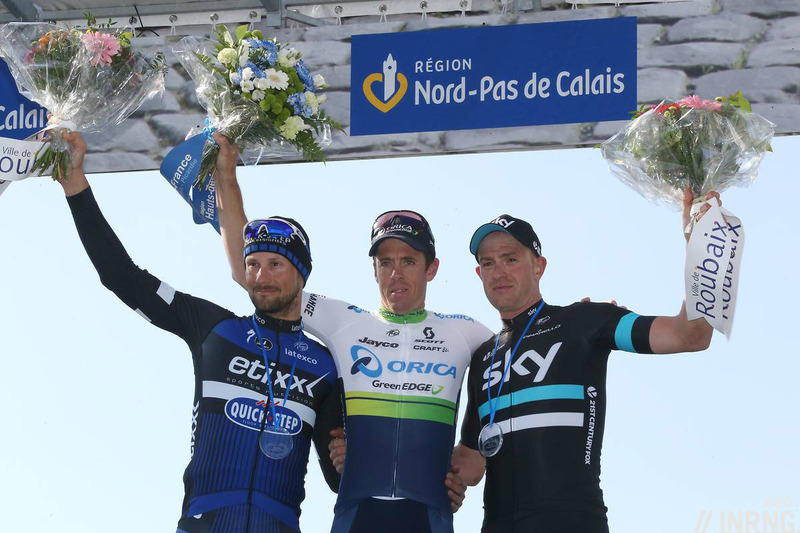 The narrow nature of the P-R secteurs means you’ve got to fight for position, which is what Stannard did there. Didn’t look like much of a chop though – he snuck up the inside and Hayman had to adjust his line, which meant he couldn’t power out of the corner and so lost the wheel. Watching the OGE Backstage Pass they do show Stannard smiling and shaking hands with Hayman later. Hopefully the two were able to settle their differences and leave it on the course. Boonen seems to have a good attitude. He looked as happy that Sagan won the worlds as Sagan himself. Imagine standing on any step of the podium at P-R 6 months after having a 5 inch skull fracture. Boonen’s post race interview – quoted in Cyclingnews- gives a really good impression of what it’s like to be in the race. Whole race live = more power for ASO? They can show the UCI that they attract biggest stars, biggest audiences, most fanfare etc, and don’t need races to be WorldTour? I don’t know… I look forward to your follow-up post. ASO certainly had the computer boffins / lawyers hard at it, blocking many of the pirate streams. I don’t know if the live broadcast does much for ASO, it doesn’t bring in a bigger audience, just has some people watching for longer. It’d be strange if Paris-Roubaix wasn’t in the World Tour but presumably all the teams would love to ride, if anything their cycle manufacturer sponsors have to be at this race to validate their “strong but comfortable” claims, the race is one giant trade exhibition. I’m not sure Scott are going to be able to make their “strong but comfortable” claims in the way they hoped. Apparently Hayman road their standard aero bike. I was absolutely delighted to see pictures of Avid Shorty canti’s on an Ag2r bike. Made my day that did. Same as the ROCKSHOX Duclo-Lasalle used back-in-the-day. Later it was said the thing was locked out for the entire race. Still waiting to find out what “game” will be changed by the Pinarello bike with the shock in back? Perhaps the sales/marketing game since nobody seems to want to buy one? While equipment FAILURE will certainly affect the race, it’s (as usual) clear that it’s the RIDER who wins the races, not the bike. May it ever be so. The Backstage Pass sees one of the other riders mention that Lars (whoever that is) said he’d have done even better had he been on the Addict. Clearly it was a talking point but it’s also clearly very personal – Cancellera picks against the crowd and so do many others. Having it all live was fantastic. It wouldn’t be so great every year, but for Monuments, why not? I love watching a race from start to finish – you feel totally involved in the race, because you’ve seen every bit: you know exactly why this person is in that position at this time. The odd TdF stage (has to be a big mountains stage, I think – not sure their plan to show all of every stage is such a smart move) where they’ve shown the whole thing was similarly fascinating. I think it works for P-R due to the parcours. The first 50km+ will always be a battle to get into the break. Then there will only be a minimum of 50k to before the first pavé. It’s always nice to be able to see the start of a race. While I wouldn’t necessarily want to see every minute of every stage at a Grand Tour, the first hour is often full of really hard, eventful racing, so it’s a shame it rarely gets seen. It’s the middle section that is often less interesting. In an ideal world, I’d be able to watch the start, go for a quick ride and pretend I’m in the race myself, then come back for the finale. Was a great race. In hindsight, Hayman chasing down Boonen was the moment the race was saved as no one else had the legs at that moment. It won’t work for every race but who knew watching a road race from start to finish could be so exciting. Great race with so many different narratives- today’s edition proved that at least Paris -Roubaix is worth coverage from the flag. Other races might not provide such justification for fully broadcasting every km (Liege-Bastogne-Liege, I’m looking at you!) but it really worked today. On a slightly unrelated note (apologies if this derails from INRNGs fantastic analysis) but Popovych’s retirement from racing after today got me thinking. Just like Bradley Wiggins and Cadel Evans last year, he has retired during the season- does this mean that the teams rosters will now be one rider short for the rest of the year? Seems a bit unfair to fill a place on a team for just a few months and prevent someone else having that opportunity. I recognise that these riders provide great service and are deserving of a nice farewell but would it not make more sense to finish at the end of the season? The switch to the staff is a planned move. Popo made the DS-course last year and will be in Treks race-staff from now on. That’s right and there can also be a saving in cash terms too. Apparently Boonen was/is set to announce his retirement today but yesterday’s ride has given him second thoughts. Any half-season halt means a lot of money saved for the rest of the year, especially for spring classics contenders who often vanish for the rest for much of the rest of the year. Boonen might fancy the Worlds though if he stays on. 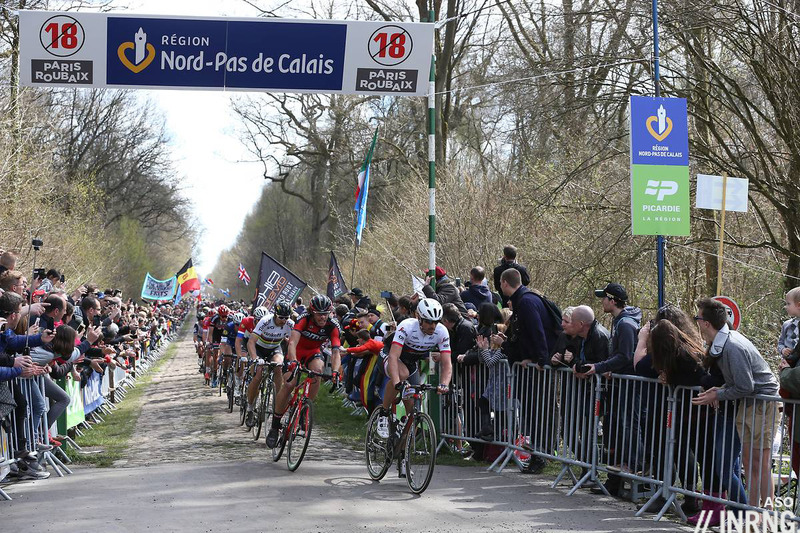 I usually stick up for the Ardennes Classics but if somebody said ‘right, we aren’t going to bother with Amstel Gold next week we’re going to run the pave sections of Paris-Roubaix in reverse instead’ I wouldn’t complain. I’m not feeling inspired about writing a preview for the Amstel yet. Today is one of the real cliff edge points in the season, the calendar can seem jumbled at times but a big chapter has closed with the end of the cobbled classics and a move towards the Ardennes and then the stage races. There’s always the Tro Bro Leon next weekend too. Hooray for the Tro Bro! +1 for Tro Bro Leon! What a great race with a great cult following. The link to the ‘Labour Race’ was very interesting, thanks. Only the Giant Alpecin team used the stone showers after last year’s edition then? Apparently so and of course that was good publicity for a team sponsored by a shampoo company. What a race, watched from start to finish and you didn’t know who was going to win until the last second. Edge of the seat stuff the whole time. The look on Hayman’s face after he crossed the line, it was a look of pure disbelief that he had won. Literally he didn’t know that he had won. A lovely moment, that, the realisation afterwards. Provoked plenty of laughter amongst the assembled in Look Mum No Hands. The sprint finish was exciting to the very end, but you could see that Boonen didn’t have the zip in his legs–like the Tommeke of years gone by. And with Cancellara the only one to slip and fall out of the pace line on the cobbles, looks like Father Time has caught up with these two champions of the past. That is the ultimate irony since Mat Hayman is older than both of them! Cancellara and Boonen both being 35 and Hayman 37!! I can’t get the horrible image out of my head that Hayman looks like Jeremy Clarkson as he crosses the finish line! Fantastic edition, another great write up. Who wouldn’t spend the first couple of hours fighting to get in the break when you know you have a much higher chance of being in the winning move – as Hayman showed? Or a top 10 as Imanol Erviti showed last week and yesterday? Not being Belgian and knowing much about his personality, I also agree with the above commentators about Boonens attitude and interviews – they guy seems genuinely happy just to be on the podium. Cracking stuff, 364 days and counting. A fantastique win for a terrific domestique. About halfway to two-thirds of the way through the race I was saying to myself “this guy is powering along… can he do it?” With the form he was displaying I thought he could be on the podium, but that the top spot could elude him if up against a sprinter like Boonen. Happily, as an Aussie, that wasn’t the case. Canberran cyclists will be especially happy today. What impressed me most with Hayman was his positioning on the road, in the bunch and his timing of efforts. A sweet win for experience. The broadcast was wonderful in Oz, especially with expert commentary from Messrs. McEwen, Vogels (both have ridden the race before) and Hayman. +1 A victory for experience, persistence, patience and by his own admission a relaxed attitude going into the race. The commentary was very good and for once we shook the cultural cringe by using our own cadre of commentators. Even Tomalaris was low key but he’d been up for 2o hours apparently. It’s one of the races that is made exciting by showing it in its entirety. I find most pro racing tedious these days as the break is established, then caught and only the last 30 or so kms is attacking racing. When they were into their lap in the velodrome and Heyman was on the pole in turn three leading the sprint out I did not imagine him holding off Boonen and Stannard at all. An amazing race. Let’s hope the Ardennes races are as good. Been very impressed with Robbie and his local knowledge this week and last. You can tell he lived in Belgium for most of his pro career. A good foil to Matt Keenan. Almost as good as an INRNG write up. Robbie McEwen however is indeed an excellent foil for the cycling encyclopedia that is Matt Keenan, he brings a connection to the riders of this era that is missing in the Phil/Paul show. Plus he’s got a fantastically colloquial turn of phrase reminiscent of Uncle Barry at a Boxing Day barbie! Heard lots of great things about McEwen, he seems to be able to spot what is going to happen rather than comment on what has happened. Be interesting to see how he does when he comments on races he’s left familiar with, ie non-sprinting, non-Belgium. Of course he’s ridden the Giro, Tour etc so hopefully he can carry on just as well. He was very good commentating from a moto at the Cafel Evans Ocean Race. Hopefully hear more from him on UK TV too. 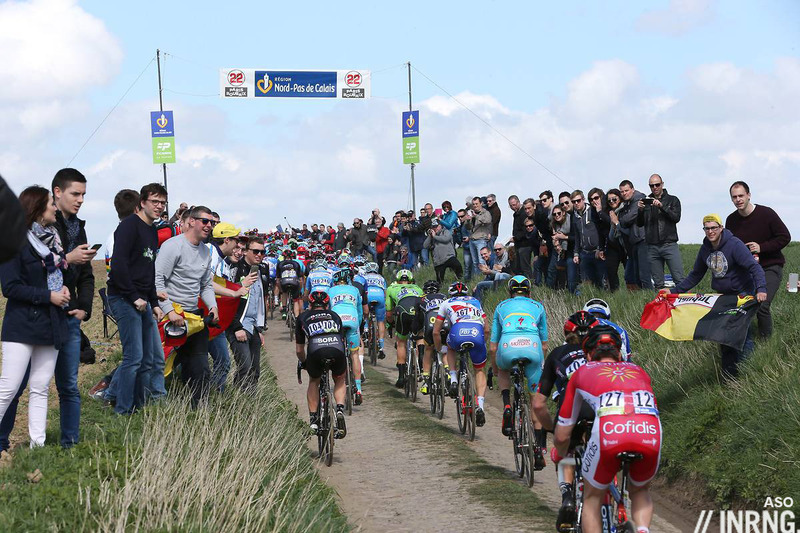 A great Paris-Roubaix overall, the best for years. Incredible skills from Sagan again to avoid Cancellara, fantastic last 10km, and an underdog victor. Likewise Laurent Jalabert on France Televisions. A masterful analyst who reads the race smartly. In the final kms yesterday he was calling which rider would be attacking next, and who would counter first. He was right every time. He may have copped a lot of flack last summer for questioning some riders’ performances. But he remains head and shoulders above the usual field of English-language commentators. Including Kelly. And… on the subject of commentators, can anyone explain the growing trend toward faux pronunciation? English speaking commentators ignoring the Peter in Sagan and going with Petta..? Contador pronounced as if there is a whole team of rolling Rs at the end of his name. And a hundred other hugely irritating examples. So far as I can tell, its the only sport where this form of ‘I can talk in 30 different languages’ form of commentary occurs. Imagine if the Champions League was broadcast similarly? Thankfully, there is a way round it with cycling on Eurosport player – by using the alternative feed which is not only commentary but advert free. On a happier note – a magnificent, dramatic race, a worthy winner and chapeau to all. It may well be six hours I’ll never get back but I’d happily relive that all over again. I wonder if Flanders or L-B-L was broadcast similarly if the form of racing might be different? I have to disagree. Making an effort to pronounce a person’s name correct is the least I would expect. We have probably been guilty in the English speaking world of lazily anglising a name for too long. You’re obviously referring to Hatch and as he attends the races and meets the riders I expect he has made the effort to find out what their name is. I know there have been discussions here and on the cycling podcast for example on how to correctly pronounce the Polish former world champions name. We could just called him Mike Jones for simplicity. Sorry for a bit of a rant response. Everybody welcome to their own opinion etc. Nothing wrong with commentators making an effort to correctly pronounce foreign riders’ names or local place names along the course, but it becomes irritating when they do it with much aplomb and still manage to butcher the names or just overdo it. Even worse when they do it on top of abysmal race commentating, like the Kirby guy on Eurosport… it always feels like he’s trying hard to use his commentating style to compensate for his limited understanding of bike racing and his lack of recognition of bike racers in the peloton. To top it off, he has the bad habit of glossing over earlier miss-calls or omissions, and his co-commentator poor Sean Kelly seems either too polite or too embarrassed to call him out on it. Agree with your frustration. I think it was him, who on the last stage of Tour de Basque Country, excitedly called Contador “Bertie”. Does Alberto Contador usually go by that nickname? On another note, here in western Canada I switched the French broadcast when I lost my connection to Eurosport, and decided to stay there, I thought those guys did a really good job. Is this a growing trend? I still remember Heckel (before Jeckel) saying CHEE-A-POO-CHEE and GOT-EE and then trying to explain to our clients this was incorrect…and getting argued with! “If Shill Phigett says it, it must be right!” they’d say. Sorry folks, Ol’ Shill doesn’t know what he’s talking about. I’d rather the guys at least try, especially when their co-commentator says it halfway correctly, why do they insist on anglicizing it? The worst for me is the guy who insists on saying COUGH-A-DIS when the publicity caravan song is so plainly COE-FEE-DEEZ. This winds me up. There’s one guy on Eurosport that uses the same faux accent for all non-English names. So much so that a) he never pronounces anyone’s name correctly, and b) I can’t understand who he’s bloody talking about. +1 for para 1. I think Rob Hatch is the main offender. I frankly find it pretentious and irritating and detracts from his otherwise reasonable commentary. I tend to like the ex-top professionals best. Peloton. It not a collection of pellets. Not quite the Champions League, but the English Premiership this season got every player to pronounce their own name correctly, and sent the files to broadcasters. In my view, it’s basic politeness to get someone else’s name right. Not just basic politeness, but it shows basic professionalism for your craft as a broadcaster. I work radio as a sports commentator and newscaster and spend a small yet concerted amount of time each morning pre-show making sure I have learned the appropriate pronunciation for names, places etc prior to broadcast. For what it’s worth, when you place a series of letters side by side, and you’ve been taught to pronounce those letters a certain way, then all good! Use your understanding of language and pronounce accordingly. I am English, so I pronounce words according to the English language. If you are French, then pronounce them they way a Frenchman would. Pronounce my name in French and it sounds wrong? Who cares – you’re French! Or Dutch. Or Italian. Or Whatever. Pretending to say it as another language or culture would is actually paying your own language and culture a disservice. I have to disagree. Learning how to accurately pronounce someone’s name – no matter what language they happen to speak – has nothing to do with “paying your own language and culture a disservice”. It’s also not “pretending”. It’s just “correct”. Cycling commentators can (and frequently do) anglicise pronunciations of names and places, but that’s essentially because they cant be bothered finding out what those people and/or places are actually called. I have to salute Rob Hatch for doing his level best to provide accurate pronunciations. If you want to revel in mangled names and lazy pronunciation as a means of celebrating the English language and cultural heritage you can watch the TdF on ITV in the UK. +1 Respect for the craft. Sadly, way-too-many English-language cycling broadcasters sound like amateurish hacks who got the job based on a “Hey George, know anybody who knows anything about cycling?” type of job search. I can remember years ago ol’ Heckel going on about the Passo POUR-DWAH as if the Giro had made a journey into France, then going off on a small rant about the colors of the various Giro leaders jerseys being chosen just to confuse him/us!!! I thought, “THIS guy is the so-called DEAN of English-language cycling broadcasters? I guess the bar isn’t set very high.” before hitting the MUTE button. I think pronouncing names and place names as they’re meant to be pronounced is a good thing. I opted to listen to McEwan on the Aussie feed this year, but I tune in to the FT feed for every major race that LJ is analyst on. He rarely makes a bad call and his insight is the best out there right now in that role. I actually muted my television here in french speaking Canada (RDS was our broadcast partner) and listened to McEwan end Keenan via pirate feed in the background. The best thing was that Matt Keenan has finally learned to be a bit more impartial. Sunday night’s effort was streets ahead of his embarrassing – almost orgasmic – call of Michael Rogers’ two Giro stage wins in 2014. For the mountain stages that Robbie has less of a connection with, there’s always the option of swapping him out for David McKenzie to provide colour commentary with Matt’s play by play call. Robbie would then do the pre/post-race rider interviews which Macca would do on the flat stages where Robbie is commentating. Either way, the SBS commentators have finally shown they are up to the task of doing the big races. Let’s hope that we get them calling the Tour de France this year, we can’t wait a year longer for Phil Liggett to descend even further into his senility. In his post-race interview Boonen summed the strategy for a Roubaix vélodrome sprint up like this: “The one in front at the last curve, wins”. He himself got boxed in by Sep and didn’t win. Nobody has much energy left, a sprint after 250km is always slower but imagine the effort after all the cobbles have shaken up the rides, blistering the hands, tiring the arms and more plus you’ve done 25 intervals leading into the sectors and had to attack or respond to attacks in the final hour. By Roubaix you’re running on fumes. Pretty simple – you DO what Hayman did and you DON’T do what Boonen did. The difference between a trackie and a roadie was pretty well illustrated there. My wife (ex-trackie and roadie) pointed out the danger from Hayman as soon as they let him get back into the lead group. Big, big mistake, especially by Boonen. One note about Sep Vanmarcke – this guy seems like what you’d get if you gave Mr. Magoo an F1 car. Larry, is he the Pierre Rolland of the cobbles… all energy wasting attacks with no outcome…? Mathew Hayman’s first and last names are spelled wrong at the start of this entry. Thanks for making the correction! An entertaining race but one I’m not (yet anyway) ready to call “vintage”. Watching the TV coverage we were wondering what would happen if Hayman was in the group on the velodrome. When he was bumped out of the way, we began to think our heart’s choice Boonen only needed to ditch Boasson-Hagen, the only one who might beat him in a sprint. But they dicked around and let Hayman get back on and from that point they were doomed, as his track experience won the day. Two things I still don’t understand – how the Cancellara/Sagan group failed to close the gap after the first “Sky-fall” should have slowed the lead group down and what were those Giant-Alpecin guys doing with Sagan once Cancellara had crashed and been dropped? They had nobody up ahead to protect but seemed to be JRA no matter what Sagan did or said to them. Was someone paying them to make sure Sagan didn’t get back up there? I have yet to read any quotes from the day so maybe this has already been explained somewhere? Surely Sagan is asking WTF? The velodrome call on Sporza was just as incredible. Those two doing the last 3km is music. What a beautiful sport we love! That was an awesome race! When OGE let Sebastian Langeveld go and recruited a 35yo Matthew Hayman I thought they were giving up on the cobbled classics, or at least making them a lower priority. I didn’t see this coming. The career domestique unexpectedly wins his favourite race, winning from a group of 5 in which he is the least favoured rider. A great story – fairy-tale stuff! It’s been pointed out in the comments above but that’s 3 monuments to OGE compared to zero for Sky…….and all of them won by ex-Sky riders! I think Hayman was more brought onto the team to replace Stuart O’Grady (incidentally a former Paris-Roubaix winner himself) as a road captain and mentor to the younger riders. Jens Keukeleire (6th at P-R last year), is their main guy for the cobbled classics along with Hayman, Docker and Dubridge. But yes, fairy tale stuff, especially for a guy who spends more time riding on the front and carrying bottles for the likes of Matthews or Caleb Ewan, chapeau. The driver of this thing should NEVER, EVER drive in the race caravan again. The riders were paying attention and those not crashing were able to stop, despite those antiquated brakes that squeeze rubber blocks onto the wheel rim – what is this guy’s excuse? We don’t know the full circumstances of this, perhaps the driver already pulled a wild save to avoid another rider or manoeuvred to avoid crashing into the crowd? It could be they were equally reckless too as you suggest but this website isn’t the place to prosecute them on the basis of one video clip with a narrow range of vision. You are correct, I should have left my editorial comments on this until after the pile o’excuses and CYA stuff comes in. But I’m in 100% agreement with the rider’s comment. I think that this Paris Roubaix will live in the memory actually. More for the riding quality which was more prevalent than especially demanding physical conditions this time. After Sagan’s incredible front and rear double wheelie (or the biggest bunny-hop in history, take your pick) to get over the fallen Cancellara and stay out of trouble there was some further great riding in the last 50k. It was like Super Mario with different riders popping up when you though they had gone. First Rowe getting back to launch Stannard. Then Stannard himself seemingly gone after each of his big efforts only to bounce back again and again and again. Hayman himself fighting to stay in touch (I thought after cornering poorly rather than having been bumped by Stannard). Boonen seemed to just keep riding like a Duracell bunny. Having been brilliantly helped by his team during the earlier splits in the race Sep V was there to test the rest as best he could, which was severely and repeatedly. Boassen Hagen had the least to give, I thought. At the sprint Boonen did not use the banking as he probably didn’t have the strength to get up it. Sorry to see him miss out on a record, but of course his reputation is assured and Hayman as a surprise winner and an old timer certainly deserved it. Best race in years, I’m still gutted Boonen didn’t win though! The last 10k was like a few punch drunk fighters desperately trying land the killer blow and failing. Hayman was the last man standing in effect. What a race. My heart man Boonen had me believing he could get 5, then to loose at the last. It can only be cycling where the winner regrets winning and the guy who came second doesn’t mind. Should he retire now? Probably, but carry on. One more year. Well done Hayman. What odds yesterday morning on that podium. Was rather surprised when I checked the results to see that Cav finished in 30th place. Given it was only his second Paris-Roubaix and that he was caught behind the race splitting crash, pretty good performance. And you’ve got to wonder at Ettix using up Tony Martin like that. He looked pretty awesome as he pulled on the front for mile after mile, have to wonder what he might do in the future if he’s allowed to just have a go with 40km to go. Best Paris-Roubaix I’ve seen (accepting I’ve only been watching them for a decade or so). Yes, Spooferoonie, I am uncertain what to think about Etixx. At the time I thought ‘here we go again’ wastefully using up such a superb engine by putting him to work pulling for 30k when the race still had a 100k to go; but then Cancellara had just fallen off back in the race and Etixx were doubtless radio’ed to capitalize. In the end it did get Boonen as close as could be. You are right though –if they can save Martin for the last 40 they have even more of a real weapon in their Classics squad: perhaps with a Columbian sprinter to finish off in the future? I think they missed Vandenbergh he would of taken is Share of the job , I think van kiersbulk faded rather quickly,still in the end Boonen was there . I guess if Boonen hadn’t got boxed in the Velodrome we’d all be saying what a masterstroke it was having Martin keep Cancellara and Sagan at bay…. Etixx got their strategy right, for once. The only way they had a chance was if they went all in on one option rather than racing each other, and it worked. Stannard is difficult to watch as he ALWAYS looks like he’s blown; rocking from side to side, knees out, pushing a huge gear, letting them put a couple of metres into him… then off he goes on the attack. And it did look like Rowe managed to get back on and had a brief chat with Stannard before launching one last attack to break up the group. Watched it from start to finish, and had it on a tablet in the kitchen so we didn’t miss anything when getting food and beer! Stannard doesn’t look like a cyclist at all, he looks like a rugby player who’s been given a bike to shave a few pounds off. I reckon he’ll be on a bit of a diet before he becomes Froomes work horse in July. There were a few times when I noticed his knees sticking out too. I do that on a long ride when my shorts have started to rub, after 250k on dusty cobbles I wouldnt be surprised if he had a similar ailment! Watched it from start to finish and only moved when the ads came on. Fantastic, worth my annual Eurosport subscription in one go! Although with their app you can switch to the commentary free stream during the adverts. More reasons to never leave the sofa! Didn’t realise the app allowed that. Something to note for future races. Not sure it’s for all races, but there sometimes as an extra channel called UCI World Tour or something like that. It had Strade Bianchi live when main channels only had highlights later. As many have said above a great race. I think the top 5 all deserve commending for their efforts in the final. I don’t think any one of them totally sat on avoiding work. One would attack, look like they had made the gap and another would bring it back. They all brought it back at least once. As a Brit I loved/hated Stannard’s tactics of looking completely gone, hanging off the back briefly, knees out etc, to only surge past seconds later. When he went up the bank on the last corner in the velodrome I thought he was using some track knowledge as was going to get the win. Great edition all round which I think I managed to watch about 90% of (weekend decorating got somewhat delay). This edition of the race had it all. Best race of the year by a country mile and one that will get talked about for years to come. I would have said that the point the race was won for Heyman was when he went in the breakaway. He would never have won from the bunch as he would have been asked to sacrafice himself for Durbridge or some other team mate and also the break away allowed him to even his efforts out and save the matches for the finale….. Fantastic to see a worker win – a clever ride as well as a strong one. I think Trek wasted too much energy having four riders (two of them Stuyven and Devolder) in one of the very early breaks – at the time I thought Cancellara must have been furious. EQS had Martin do too much work, allowing Sky and Lotto-J do nothing for many km. Very ballsy ride by Luke Rowe after that crash. As many said, Cancellara isn’t so good on the mud – and some Sky riders still need to do bike-riding lessons. I think Vanmarcke is just not quite good enough: he looked the strongest rider, but couldn’t quite drop the others – and doesn’t have a sprint. Stannard attacking on the cobbled sector before Carrefour probably wasn’t so smart. And a special mention for some of the finest bike-handling I’ve seen in a very long time by Peter ‘weeble’ Sagan – it’s like he fall down. Just a brilliant race altogether. But Vanmarcke had his usual Sep moments-mechanical etc., at one point he and his team had to chase the Boonengroup (sounds like a company). I think that used up a lot of his energy, because he surely by now immediately thinks: Oh no, not AGAIN! I had Vanmarcke for the win, especially with that team, but sometimes it’s like that, he didn’t even get on the podium. Besides, what else could he do but go on the cobbles? That’s where he could (and did) make a difference, surely not in a sprint against B.Hagen or Boonen. So I think that was fine. What I didn’t get was Etixx, made no sense to me, too. The fact that Sagan+Cance were gone, meant we could fully concentrate on the first 5 and take it all in. It was a great race, one that will live on in the memories like “Do you remember 2016 Paris Roubaix…” We are lucky we got to watch it that way! That was one of the best races I’ve ever watched. I think the weather played a huge part in the spectacle. While most of the race played-out in beautiful sunshine, with bright blue skies, and wonderfully saturated colours on TV. The rain in the lead-up last week meant that the verges were all muddy and soft. These no-go areas on the majority of sectors forced the riders to actually ride the cobbles for a change. And when they do, they get more fatigued, more splits happen, and the racing is more unpredictable. Last night I realised that if you want someone to get into pro cycling, the most sensible things to do is actually NOT show them the re-run of this race, because virtually everything they watch from that point on will be boring in comparison. If Flanders last week could be rated a 7 or 8/10, this will be about a 15; it was THAT good and comfortably the most exciting (but not necessarily best) race I’ve seen since coming back to cycling in the last 5/6years. It will be remembered not just for the falls, sub plots and surprise winner but especially for the last 20K when all the leading group were in pieces and couldn’t break away from each other – it was completely and utterly gripping. All five would have been deserving winners and special mention to the guys who got tailed off, but still kept 20/25secs behind to keep the leading five racing honest and racing eyeballs out to the velodrome. A great write-up of a great edition of the race. “A lunchtime reservation” is another classic (no pun intended) line! When Boonen was up front in the final with Hayman I was dead sure Boonen would win from a fake sprint, all the millions he (and Etixx sugar daddy spsonsors) have to spare… but no. Does this mean buying and selling races (or at least big classic ones) is a thing of the past now? Out of interest: Neil, Eddie, davidk, how do you pronounce jalapeno, with a jay? It’s not meant to be a dig, it’s an honest kind-of-question. I don’t know anyone (I live in England) who puts a jay sound on the front. It would make you sound pretty, shall we say, ‘UKIP’. Equally (if my Spanish knowledge is any good, which is a fairly big ‘if’) it should be more like hal-a-pain-yo rather than hal-a-peen-o. For some reason the former makes an English person sound pretentious. Totally off topic but generally you get interesting responses on this forum. On topic: anyone else looking forward to the next OGE backstage pass? I saw Dan Jones at the finish so I assume it was being covered. Fantastic race, although I taped it all I only watched from about 5k before the first section at Troisvilles to get the gallop into that first sector. It will be kept for some time I think. Regarding commentators, all I’ll say is that I watched the Pays Basque Eurosport UK coverage with mute on, even though Magnus usually adds a lot to the commentary, it doesn’t overcome inanity. Hatch is a bit affected in his pronunciation but I’ve dialled that out. Thankfully “You’ve got to remember…” is also used less now by a certain Scottish commentator, I counted it being used 11 times in one 2.5 hour bit of race coverage. Great race, and great re-cap. Still shocked that Boonen didn’t win, but glad that nobody gifted it to him. Amazing that he came back after last fall’s crash, with any luck he can keep building his form for next year! Just like Inrng, I’m shocked that Sagan and Cancellara were so far back when that crash happened. Maybe they just switched bikes or something? Bonehead play. I met Mat Hayman a couple of times in the past month – – on Zwift! He went by me at a steady 4.5-5.0 W/kg, and then sprinted up the virtual hills. He credits the virtual program with helping him maintain his form despite the injury. Huge congrats should go to Phil Gaimon for jumping in at the last minute and not even able to pre-ride the course! Also, who supplies Team Sky with tires or who sets the tire pressures??? I think Hatch sounds swanky – like he can actually speak the language of the rider whose name he is pronouncing. Appropriately europhile for eurosport. La maladie anglaise? Fear of other languages. I would ordinarily be gutted for Boonen, but seeing Hayman win was just such a treat. It was like a heightened version of Steve Cummings’ stage win at last year’s Tour. Superb. I also continue to be amazed by Sagan’s bike handling skills. How he managed to stay up in that crash is beyond me. He literally rode right over Cancellara. (After Flanders, I suppose you could say for the second time!) Add that to his miraculous save at MSR and you have to ask whether there has ever been a rider with better bike handling skills? Was there for the weekend, and what a weekend to go! Rode the cobbles on Saturday and watched at the Carrefour De l’Arbre. Missed a fair chunk of the racing getting into position, but guessed there must have been some significant crashes leading up to the Cdl’A given both the composition and gaps between riders. Seeing Sagan trail by so much, and Cancellara by even more, can only have meant one thing. I was surprised by how thin the peloton was by the Cdl’A. The biggest group was probably 10-12 riders. And I don’t think I saw much more than 50 riders. But you have to give major kudos to the stragglers. Some of them are riding hard on their own for nothing more than their own pride at that stage – with some many giving up why risk injury for no reward?! I have a perfect picture of Cav looking at me – which surprised me because I wasn’t expecting him to even be there, let alone with Cancellara’s group! He did well. Shame he has left it so late in his career to cycle it. One thing I have to say is that pros had it easy in the Arenberg. That was one slimy, muddy, wet, bobbly piece of work on Saturday. 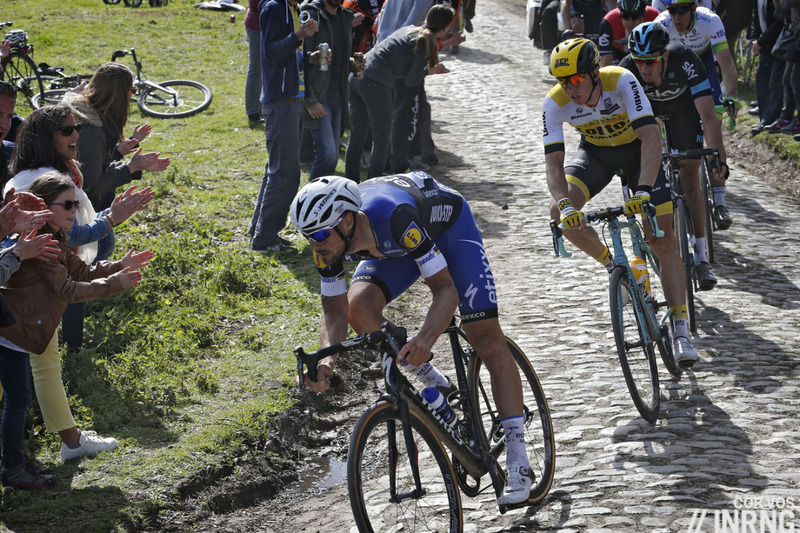 Riders had hardly any control, and that motorcycle crash looked predictable under the circumstances – possibly the motorcycle rider mis-read his ability to stop, Arenberg is so different from all the other sectors, it’s hard to show that on TV. The cobbles dried up A LOT by Sunday afternoon, even though they still appeared slippery…..but having ridden it, the pros make it all look so easy. Riding a million speed bumps for 2km every other 2km is a leg wobbler. What problems. I watched Eurosport German. With Migels and French/Italian/Spanish speaking Jean-Claude Leclercq they just get most pronouncations right. Plus they had TheJensie Voigt on their site, who can’t pronounce as Ex-Ossi, but always has some funny remarks and insight stories. See Hayman won PR on just an “ordinary” Scott Foil Aero bike with no fancy bits, or taped up this n that. Who would have thought you could win this event without the aid of some spongy bits in the frame. Just goes to show. cometh the man cometh the hour. Apart from Hayman’s utter disbelief, my favourite aspect of that video is Luke Durbridge’s reaction – such genuine joy. I don’t think he could have ben any happier if he had won it himself. Thanks for sharing that. Not ashamed to say it had me welling up several times. Lovely, lovely video. So happy for him. Next post: Why Show The Whole Race?